You can reach us from the Netherlands by the new tunnel, the Westerscheldetunnel, from Goes to Terneuzen or through Belgium. 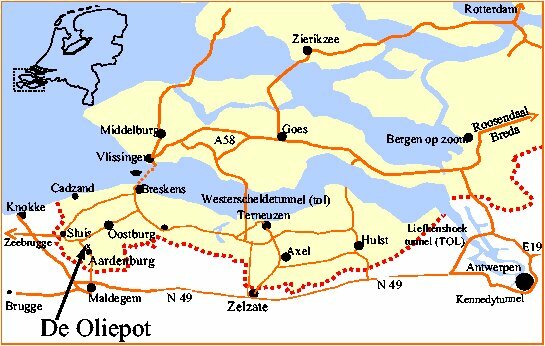 If you come through the Westerscheldetunnel (the toll is € 5,00 for a car and with a caravan € 7,45 lower than 2.50m and € 18.20 higher than 2.50m), take after the tunnel the route to Oostburg and after Oostburg take the direction to Sluis. Take on first roundabout after Draaibrug the route to Aardenburg. On the second roundabout go three quarters round and immediately go right. You are now on a small road, parallel to the larger road to Aardenburg. After 1500m on your left is the mini-campsite ~de Oliepot~. (N49 / E34 / A11). At the city of Maldegem, there is one (only one, so please pay attention) sign with the name Aardenburg on it, take this direction. Before you have arrived Aardenbrug follow the newbury bypass Aardenburg to Oostburg, Sluis. At the 3st roundabout, the one with a tree in, take the small street parallel to the main road. After 600 metres, you will find the campsite ~de Oliepot~ on your right. Take the directions to Sluis and from there on to Oostburg. At a roundabout at 3.5 kilometres after Sluis take the direction to Aardenburg, on the following roundabout go three quarters round and then immediately go right. You are now on a small road, parallel to the larger road to Aardenburg. After 1500m on your left is the mini-campsite ~de Oliepot~. +51° 17' 12,54" +3° 26' 15,21"